Three years ago, a baby bear was found at a Russian airfield and now lives there with aviation staff at the Oreshkovo airfield in Kaluga region, which is about 200 kilometres south-west of Moscow. 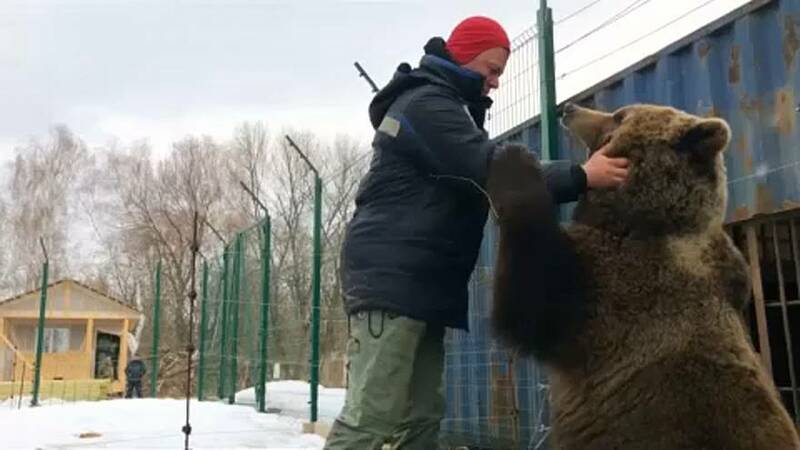 The brown bear, named Mansur, is taken care of by everyone but private pilot Andrei Ivanov has a special relationship with the mammal weighing in at about 250 kilograms. Andrei is the only who can enter Mansur's cage and play with him without losing his life or limb. Andrei said,"When you are constantly in touch you understand what is on his mind when he wants to wrestle you, play around. The fact of good-natured communication does lots of good, this beast is not aggressive, he understands his strength. Look at the paws they are relaxed."